Kentucky in the Early 1900s: A Postcard Tribute provides a unique and intriguing glimpse into the history of the Commonwealth of Kentucky. The images included in this book have been selected from an extensive collection of vintage postcards assembled over the last 35 years by Carl Howell, of Hodgenville, Kentucky. They provide rare insight into the lives of ordinary Kentuckians in the early 20th century. Viewed in their entirety, they reveal a panorama of subjects that shows who we were, what we valued, and what we accomplished. During the Golden Age of Postcards, photographers took pictures of cars and trolleys, mines, courthouses, firefighters, county fairs, trains and depots, sports teams, businesses, special events and everyday lives. People regularly bought and mailed postcards, often with handwritten notes about the places and events depicted on the cards. 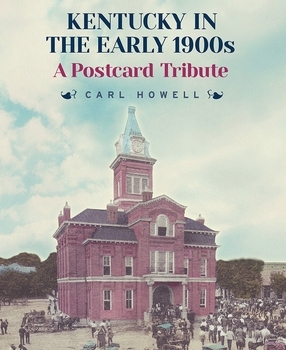 Howell, a renowned and respected postcard authority, has written detailed narratives about all of the images he has included. This well-researched book makes a unique and lasting contribution to literature about Kentucky's history and people, and will appeal to history buffs, photographers, and anyone interested in the Commonwealth of Kentucky and its heritage. Carl Howell is known statewide as Kentucky's premier vintage postcard collector. He has co-authored three Kentucky county history books which are illustrated by his extensive postcard collection and, in 2003, he authored a volume entitled, Lincoln's Kentucky Years. Mr. Howell graduated from LaRue County High School in 1959. He majored in English and received a Bachelor of Arts degree from Georgetown College in 1963, and a Doctor of Jurisprudence degree from the University of Kentucky College of Law in 1966. In December 1966, after receiving training in Quantico, Virginia, and Washington, DC, he received his appointment as a special agent in the Federal Bureau of Investigation. He served in this capacity in Buffalo, New York, and New York City from 1966 to 1969. In his early professional legal career, he served as Hodgenville City Judge and Hodgenville City Attorney, prior to implementation of the statewide district court system. He was appointed Master Commissioner of LaRue Circuit Court in 1992 and served in that capacity for over 20 years. He retired from the practice of law in 2014 after 45 years of service. Mr. Howell is a Lincoln historian and archivist and is a frequent speaker at historical events and area club meetings. He is a member of the Kentucky Historical Society and the Sherwood Historical Society. He established the first Lincoln Days Art Contest in Hodgenville in 1973, which has been a staple at every Lincoln Days Celebration thereafter. He served on the advisory board of the Abraham Lincoln Bicentennial Commission. He is president of Preservation of Lincoln's Kentucky Heritage, Inc., a non-profit corporation which was instrumental in purchasing the Abraham Lincoln Boyhood Home at Knob Creek Farm, and he gave the keynote address at the deed transfer ceremony on February 12, 2002. As president, he also served in the selection of the sculpture group responsible for creating The Boy Lincoln, a bronze statue which was unveiled on the square in Hodgenville on May 31, 2008. In 2008, he received an award for his contribution to LaRue County High School athletics in baseball (1955-1959); and in 2011, he received the LaRue County Board of Education Distinguished Alumni Award in recognition of outstanding achievement since graduation from LCHS. Mr. Howell has five daughters and is married to Sharon Howell. Together they share eleven grandchildren. He and Sharon reside in Hodgenville, Kentucky, and are active members of LaRue Baptist Church.